Thread: Cutest homemade sewing boxes! I found the cutest sewing boxes and directions for them. You can change the size so easily. But one thing befuddled me. Where to get the vinyl you sew to the front (with binding strips of fabric around it) on both sides and the bottom so you can put a label in it though the top so it says what's in the box. A window, I guess you would call it. I looked for an hour online and finally found a place. I emailed them Sunday. This morning at 7:30 am they called me and apologized for not calling sooner. They were off for the holidays. We talked and for 40 cents each, they are sending me 12-3"x4" pieces of double folded viny. She told me to just carefully cut off the small edges and I'd have two pieces of single vinyl for each double piece. Perfect! I ordered 12 pieces of vinyl at 40 cents each and it came to $4.80 plus $1.95 shipping. It came to $6.75 total. They are in California. The business is called Everyday Vinyl and their website is www.everydayvinyl.com. Check them out! Excellent customer service. I found it easier to just talk to them on the phone and explain my dilemma. A picture of the box and directions for it are here: http://www.makeit-loveit.com/2011/09...html#more-4543. I am going to start making them for next year for Christmas presents and birthday presents and just for me. They are so awesome boxes! If anyone has any other sites with cool fabric boxes, please share here!! Last edited by jcrow; 01-02-2013 at 09:02 AM. Love the boxes. Could a lid be made? I buy my plastic like this at walmart by the yard. It is a large sheet that I also cover my table with when I have my good linens on the holiday table. They have different weights available too. I have made clear makeup bags, wallets with windows and luggage tags. Here is a link to one site with cute baskets to make. Last edited by RedGarnet222; 01-02-2013 at 09:16 AM. Very cute! I've seen clear plastic like that at Joann's. WalMart has the clear vinyl in pre cut packages and by the yard. Also the vinyl bags that linens come in are perfect for cutting into small sizes. Thank You for sharing this project. We just moved into our new home and I need extra storage. Yesterday, I was searching for project ideas, not really wanting to use cardboard...these plastic sheets will work fabulously. Heading to JoAnnes today for sure! how cute they are. REally life them. I found storage boxes exactly like this at Walmart. They are beige and fold flat. I love mine and I didn't have to make them. Of course the hand made ones are much cuter. Just call me lazy. I made something that required a small bit of clear vinyl. In order to be thrifty (aka cheap), I purchased a clear shower curtain liner for less than $3. It's huge and worked beautifully. Shower curtain! Perfect idea!! Why didn't I think of that? Got our clear vinyl at Joann's and also at Walmart. You want the thicker vinly not the real thin type. We just sewed our trims to it without any special feet. Worked great. I use the Plastic covers from upholstry sample books. There is free vinyl in a lot of things if you just look for it. Wow! I love these ideas! These containers would make great gifts for a bridal or baby shower or even a house warming! Thanks for sharing! I purchased my vinyl at JoAnn's ... and was quite frustrated using it. It seems to slip and slide all over everywhere. Now, that I have finished my project I discovered you can use a special foot, telfon foot that will work really great with the vinyl. I had to do another project for my hubby and I purchased the foot and it make a 100% difference. However I was using it for a much larger project, so maybe using it in smaller pieces works easier. Not sure. Here is a pic of what I used it for. 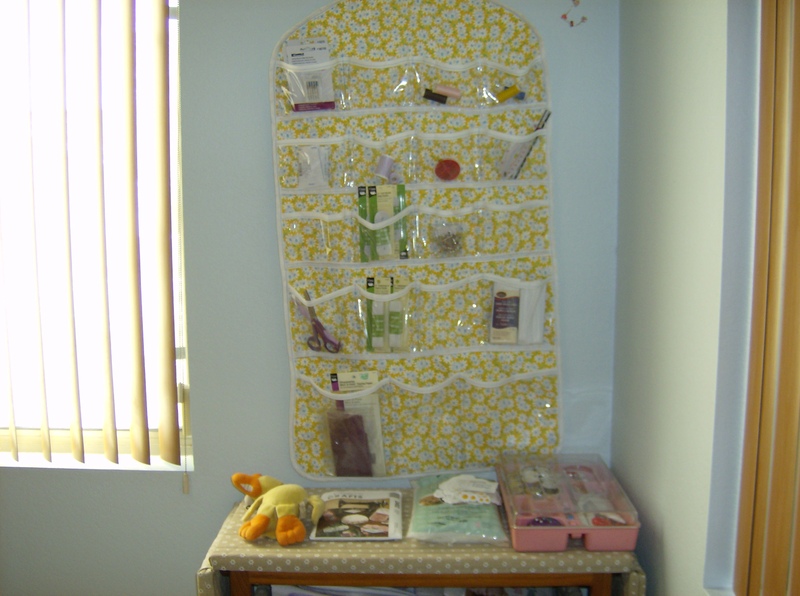 Thanks for posting, now I can get to work making a coordinating sewing center. I bought mine at Tuesday Mornings about 2 years ago. Was a great price. Wow thanks for sharing and thanks to the rest of the sites that were shared. Those are so cute and you can make them what ever color you wish. Thanks for the info. Thanks for sharing this cute box tute. I'm going to save it. Gotta finish another project but I'd really like to make a couple of these. When I sew vinyl, I put a piece of cheap-o tissue paper on top. I sew thru it and then tear it off. I usually have a big pack I buy at the dollar store before each Christmas. That looks perfect for a basket liner for the bike Santa brought me. Thanks!